Having an app is the foremost status symbol of the television network. You can have all the nice cards and fancy champagne you want, but if you don’t have an app, you’re nothing. Nothing! Comedy Central understands this, and it’s finally ready to sneak under the velvet rope and enter the fancy life with its own video-streaming app. 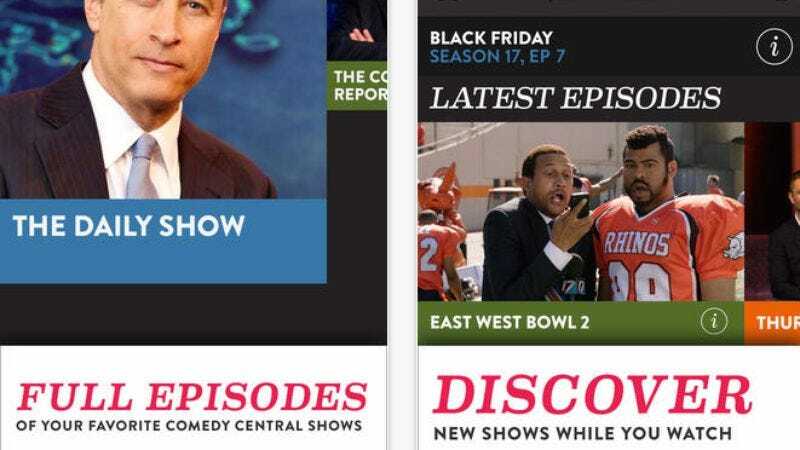 As reported by The Wrap, the new Comedy Central app—which presumably renders a lot of its earlier apps obsolete—allows all users to watch a handful of the most recent episodes of The Daily Show, The Colbert Report, and @Midnight for free, as well as select episodes from new and old shows like Tosh.0 and Chapelle’s Show. Also, anyone who’s a part of the fancy life themselves and has a cable or satellite provider can access a more robust version of the app that features more than 200 episodes of TV shows from the Comedy Central vault. Just think: Now you can watch Stephen Colbert and tweet about how he should get canceled, all without ever leaving the bathroom! Currently, the Comedy Central app is only available for iOS devices through iTunes.